A painting of Jesus with Martha, Mary and Lazarus in Bethany hangs in the living room of a former-convent-turned-women’s discernment house in northeast Minneapolis. It’s an image of how the residents see themselves: like Mary of Bethany, sitting at the feet of Jesus, listening. The house is named Bethany House for this very reason. “This is about discerning God’s will, and that’s the goal … wherever God may lead them,” said Father David Blume, vocations director for the Archdiocese of St. Paul and Minneapolis. 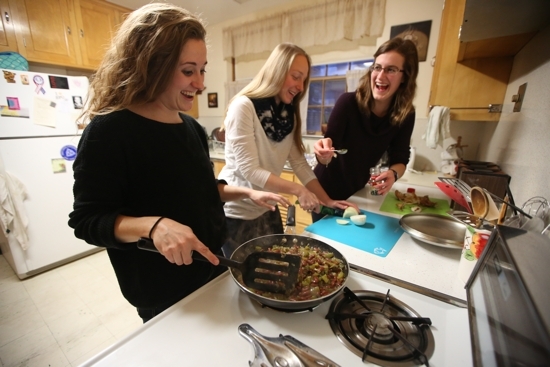 On Labor Day weekend, five women discerning consecrated religious life moved into Bethany House, a new initiative of the Office of Vocations in partnership with the Handmaids of the Heart of Jesus, a religious community based in New Ulm that recently established another convent in St. Paul. Three of Bethany House’s residents are working jobs, one is in graduate school, and one is in her senior year at the University of St. Thomas in St. Paul. 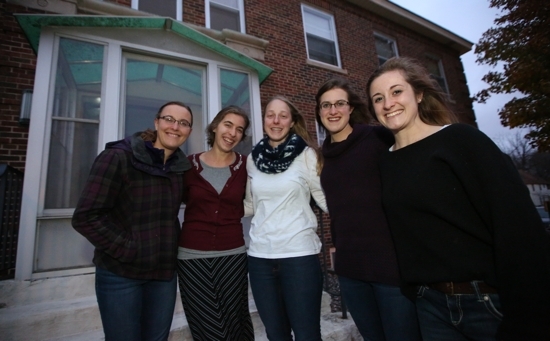 All are in different places in their discernment process, but they are dedicating the academic year to prayer, quiet and spiritual direction while living in community with like-minded women. Located at 1615 University Ave., Bethany House will be hosting an open house 2-4:30 p.m. Nov. 5. For more information, visit 10000vocations.org. Father Blume knew of the Mater Redemptoris House of Formation, a discernment house in LaCrosse, Wisconsin, run by the Sisters of St. Francis of the Martyr St. George. He thought he could launch something similar in the Twin Cities, and he turned to the Handmaids for help in developing it. The Vocations Office takes care of the house’s administrative aspects, and the Handmaids oversee the formation and pastoral aspects. Handmaid Sister Mary Joseph Evans, the community’s local superior whose home parish was St. Joseph in West St. Paul, visits a few times each month with Handmaid Sister Amata Crain to offer support and friendship. Located next to Holy Cross church in Minneapolis, the building was home to three octogenarian religious sisters — two Franciscans and a School Sister of Notre Dame — until earlier this year, when they returned to their respective motherhouses. The building was built as a Franciscan convent and could hold as many as eight women, said Father Blume, who has been vocations director since 2015. He sees Bethany House as complementing the Miriam Dinners and annual women’s discernment retreat the Vocations Office organizes. 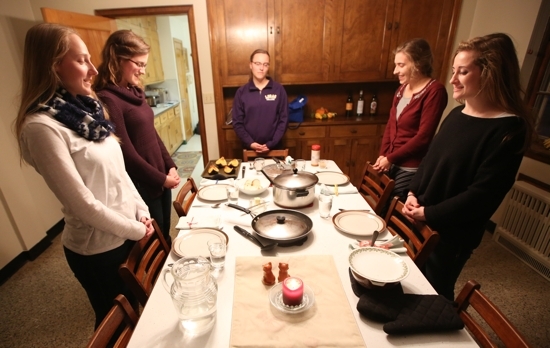 Residents commit to nine months of common living — including sharing groceries and chores — as well as a weekday schedule that includes a 5:45 a.m. Holy Hour with morning prayer in the parish’s adoration chapel, also in the house. The women then attend daily Mass before heading to classes or work. They share three evening meals each week, and pray night prayer together each night. Then they observe “grand silence” — no talking — until after Mass the following day. Weekends are typically unstructured. Each woman also meets with a spiritual director, and agrees not to date during this time of discernment. Bethany House’s first residents are Jen Andrysczyk, 23; Catherine Bittner, 24; Alex Bosch, 23; Lauren DeZelar, 23; and Emily Meuer, 22. They all learned about the house from the Handmaids, but — if they choose religious life — most haven’t determined which community they’d like to join. In the meantime, they’re grateful to live with women who are also discerning their call.